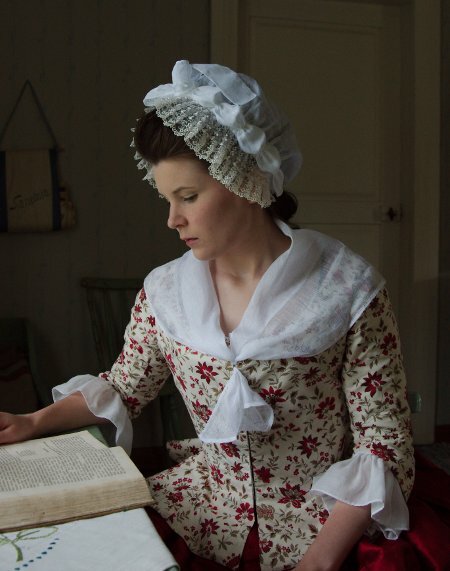 People usually begin 18th century re-enacting by making a jacket and a petticoat. I got to them only after experimenting with various other stuff. I had, for some time, thought that a more practical outfit like this would be a good one to have in my closet. I found the inspiration for it when I found a quilted bedcover which just might, from a distance, pass for silk, for 9€. I had already been acquianted with the fabulous idea of Elena from HWW to use a bedcover as a material for a quilted petticoat, as you have the top material, wadding and lining all basted together provided only that the original quilting stitches won't leave marks. The bedcover was stuck in the corner of my sewing room for about a year. Sometimes I googled designs for the quilting and carried a sample piece on my handbag with hopes of finding a jacket material which would go with it. Finally I came across a perfect match, a printed cotton with a floral design which not only bore a close enough resemblance to original period prints but also matched the color of the petticoat-to-be. Well, of course I still didn't immediately have the time to begin making the outfit. A few months later I suddenly realised that a Christmas Fair at Sveaborg was coming, and this outfit would be just perfect for the occasion. Of course I had a bunch of other stuff at my hands for the ball the same day, but then again if I wouldn't take time to make this outfit now it would be pushed back on my project schedule again for who knows how long. As I had all the materials already (not to mention inspiration) it would be such a waste to skip it. I had also recently made a jacket for my friend Ida, which had been a quick job, so another one would surely follow with minimal effort. I began with the petticoat. I was realistic enough to forget my plans for elaborate quilting patterns, at least for now, I could always take the skirt apart later. Right now I just wanted a new petticoat fast. I used the whole width of the bedcover (260cm) and even left the original not-so-neat binding on the hem. The petticoat turned out really cute and so full that I don't even need to wear any skirt supports under it - in fact, it can also be used as a skirt support under something else. 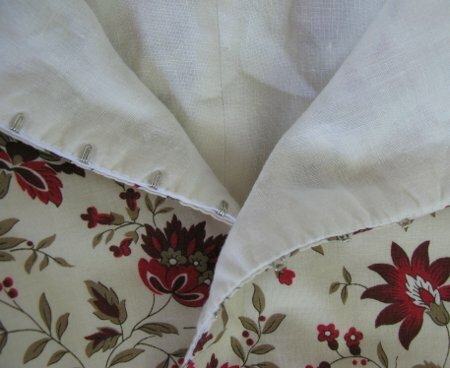 The jacket bodice pattern is a combination of my riding habit pattern and the skirts of the jacket (garment number 6) in Costume Close Up, dated 1775-1785. On the pattern the skirt flare seemed rather exaggerated but on the finished garment it looked great. I added a wide gore on the front slit to get a round hem. The sleeve pattern is also based on my riding habit's sleeve, which I turned into an elbow length one-piece sleeve. I had originally planned to have wide winged cuffs, but as the jacket had already taken a more 1770's/80's flair I decided to leave them off. As the floral print was small and quite irregular and the fabric width narrow I decided to cut it without paying too much attention to the pattern. Thus I managed to get the pattern repeating off at the center back, though elsewhere it doesnt really show. For the lining I used linen which gave some body to the fine cotton. As this was to be a quick project I bag lined the jacket and inserted ready made panels of hooks and eyes on the front edges. They stiffened the front edges nicely and were covered by the hand-sewn lining. I made up the sleeves separately and finished the armholes with a bias cut binding on the inside. To get some period flair and to keep the bagginess off I hand stitched all the edges. I also gathered the neckline a bit with a stronger thread. 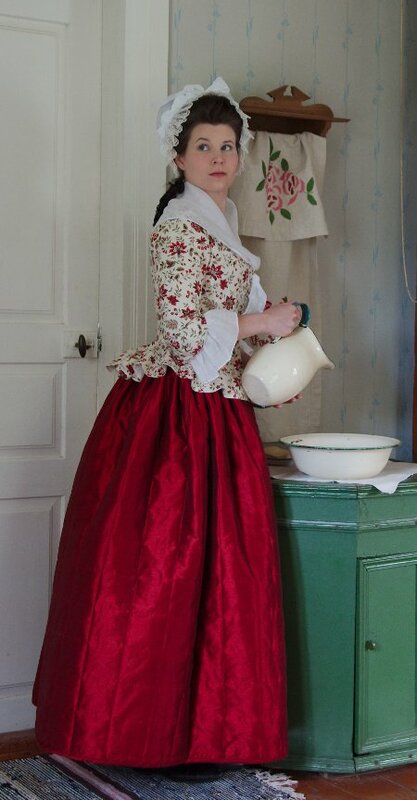 The outfit turned out really pretty, and works well as easy, practical period wear. It was also a very nice quick and economical therapy project. In the end I managed to finish everything else for the ball in time as well, so this little illicit adventure from the straight path of project schedule was not disastrous at all. As the outfit looked so 1770's I realised after wearing it a few times that it absolutely needed a silly dormeuse cap, which I finished just in time for the photoshoot. More about it on 18th century headwear. I would like to thank Seitseminen National Park / Kovero Heritage farm for an idyllic shooting location.